shop joielle: Fall 2012 Styles Are Here! Fall 2012 Styles Are Here! Our Fall 2012 styles are out and there's some exciting new additions to highlight! 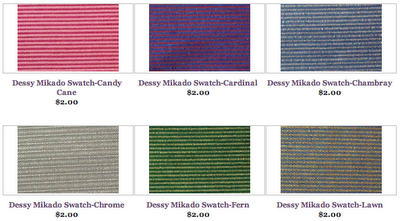 Alfred Sung, one of our most popular lines, unveiled a brand new fabric called Mikado. It has a unique variegated weave with multi-color combinations and a gorgeous refined look. Photos definitely do not do it justice, so we highly recommend picking up a few fabric samples from our Mikado swatch page. In our last trend spotting report, we talked about the lace trend, and it's showing up everywhere! Dessy's new Rococo lace is a sweet shimmery overlay available in Oyster, Charcoal Gray or Black that can be paired with any matte satin color option. We've also added Joanna August's lace options in their Ceremony line. They are absolutely adorable. We're seeing more experimentation with chiffon as brides consider it a versatile fabric for all seasons. Some of Landa Designs' cocktail dresses are perfect for both a wedding and a backyard garden party, aka re-wearability! And as always, many additional styles that don't have their own individual dress pages are found in our Additional Styles pages. Just click on the corresponding designer line and select the dress number you are looking for in the style dropdown menu. Happy shopping!